Total Wine and More is America’s wine superstore, the country’s largest independent retailer of fine wine, spirits and beer. Our typical store carries more than 8,000 different wines from every wine-producing region in the world. The typical Total Wine & More also carries more than 2,500 beers, from America‘s most popular brands to hard-to-find microbrews and imports, and more than 3,000 different spirits in every style and price range. We're also committed to having the lowest prices on wine, spirits and beer every day. Our tremendous buying power and special relationships with producers, importers and wholesalers bring us considerable savings, which we pass on to our customers. We pride ourselves for having knowledgeable team members. 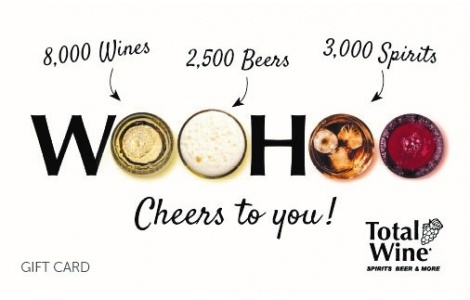 Total Wine & More employs more than 4,000 dedicated men and women, including 600 wine service team members and 50 of our most knowledgeable wine experts, the Total Wine Professionals. All our wine team members participate in extensive training programs, weekly team wine tastings and monthly wine-producer seminars. Purchase, use or acceptance of this Gift Card constitutes acceptance of these terms and conditions. Gift Card is redeemable up to balance only to purchase goods or services at participating Total Wine & More retail locations in the United States. Not a debit or credit card and no warranties apply. Not refundable or redeemable for cash except as required by law. Not reloadable. Does not expire and no fees apply. Safeguard this Gift Card, as it will not be replaced if lost, stolen, damaged or used without authorization. Gift Card is issued by and represents an obligation solely of Retail Services & Systems, Inc. or its assigns. Gift Card cannot be resold and is not valid and will not be honored, and Retail Services & Systems, Inc. will not be liable, if obtained from unauthorized sellers or resellers, including through Internet auction sites. For balance inquiries and for complete Gift Card terms and conditions (including arbitration agreement and class action waiver), which are subject to change, please visit Totalwine.com/gift-cards. Must be 21 or older to redeem gift cards with valid ID. Spirits available in select stores. To check your balance, call toll free 1-866-794-4839. Gift cards only redeemable in store, not redeemable online.